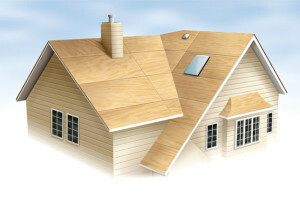 Roof Deck | Linnert Roofing, Inc.
A quality roofing job is possible only if the roof deck is sound. 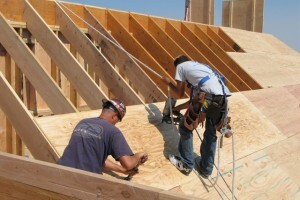 Decking (or sheathing) is the layer of a roof that is used as the base for roof coverings to be nailed to. It’s underneath both the shingle (or other roof coverings) and membrane layers, and it covers the rafters. The decking layer also acts as another layer of protection for the roof. Decking usually consists of wood materials like plywood or OSB (oriented strand board). OSB is typically more environmentally friendly in that it is made from small fast growing trees, thus preserving forests.